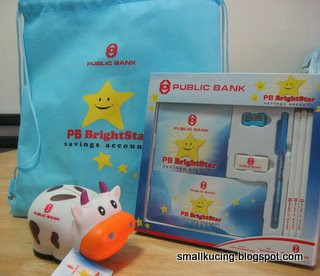 SMALL KUCING: PB Bright Star Saving Account. Auntie Siew who works in Public Bank told Mamarazzi that the Bank had launched a new Saving Account for cute kid like me(perasan). Zoom! We went and Mamarazzi got me a PB Bright Star Savings Account. Alamak! this account so "laku" till PBB, Sri Petaling ran out of Sling Beg. Well, as usual...kiasu Mamarazzi "zoom" went to the next nearest branch. Guess which branch? Aunty Siew's branch. The branch doesn't really belongs to her. But she works there la. Yikes! This branch have all the 3 items. Mamarazzi loves the Sling Bag. It would be perfect if only it's made of a better material. Nice looking Stationary set. 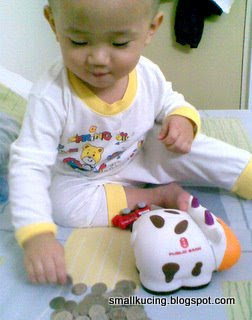 But what I love the most is the Piggy Bank..or rather in this case the Moo Moo Bank. Mamarazzi need to show me how to put in the coins once only. After that, I can do it all by myself. Left hand. And right hand too. No problem. 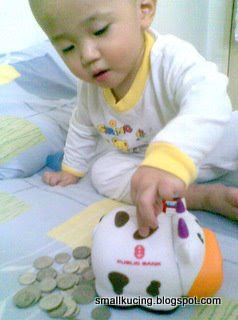 This is a video of me putting the coins into the Moo Moo Bank. What's the interest rate for that PB children account? 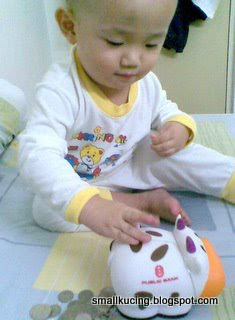 Wah...Joshua must be really enjoying himself aiming the coins into the hole of the Moo-moo Bank! Cute boy! It's a tier rate. Basically 1%p.a. if below RM50K. They have other accounts too. Check out http://www.pbebank.com/en/en_content/personal/deposits/bright.html for further information. If I'm not mistaken, currently AmBank's children account called AmGenius so far offers the highest interest rate at 2.00% for savings up to RM50 000. Last time I opened one for Juan Or at Alliance Bank's AllianceSave Pendidikan, now offering a very low rate only - 0.20% for below RM1000. Thinking of closing that account and shift everything to AmGenius. I opened the account for him for the coin box only :p. Already have one from AmBank. As for interest rate for Saving Account of most banks are not worth to take into consideration. For real Savings better put in others like Unit Trust or ASM.